Tribal leaders say 90 percent of the crime on Pine Ridge is related to drinking, as are most accidents, suicides and preventable diseases. Nebraska calls this a village: two blocks, one dusty road and six or so buildings, squat and cheap, like the set of a spaghetti western. Just over the South Dakota border, the Oglala Lakota Sioux call this place something else. They call it the root of all the pain, suffering and damnation endured on the Pine Ridge Indian Reservation. They call White Clay hell. Plopped a minute away from Pine Ridge, where alcohol is banned, White Clay provides tribal members a way to buy beer, drink, and too often, keep drinking. On any day in White Clay (official pop. : 10), dozens of tribal members in zombie states of drunk stumble around the road, prop themselves against the homely buildings, lie passed out by piles of junk on the ground. Bootleggers buy cases and smuggle them back to the rez. No bars exist here, but the four off-sale package stores in White Clay, comprising most of its businesses, move 13,000 cans of beer and malt liquor a day. The Nebraska Liquor Control Commission says that means more than four million cans of alcohol sold in a year, almost all to Oglalas. For decades, the people who defeated Custer and survived Wounded Knee have been fighting the demons unleashed in White Clay. Tribal leaders say 90 percent of the crime on Pine Ridge is related to drinking, as are most accidents, suicides and preventable diseases. 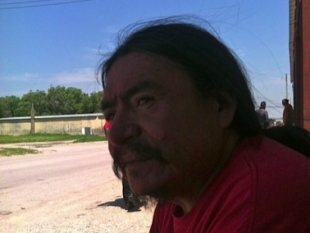 Oglalas say alcoholism is a big reason why the Pine Ridge reservation, the second largest in the nation after the Navajo, with some 40,000 members, remains the poorest, with life expectancy between 47 and 52 years. Now, after various attempts to stop White Clay’s unbridled sales, the tribe is trying its most controversial move: taking a vote on legalizing alcohol on Pine Ridge. A special election to decide the repeal of prohibition on Pine Ridge is set for Tuesday, Aug. 13. Alcohol has been banned here since the Pine Ridge reservation was created more than a century ago, with only a two-month lift in 1970. The tribal council last considered holding a referendum on the ban in 2004, but opposition from Oglala spiritual leaders quashed the plan before it came to a vote. Since the referendum was announced in June, it has sparked a furious debate within the tribe, but those on both sides of the debate agree on one point: repealing the ban will not cure a plague of addiction. Alcohol is the scourge of Indian country, legal on about two-thirds of the nation’s reservations, rampant throughout. Whether fueled by poverty and depression or the fuel of those conditions, or both, alcoholism affects Indian country at about twice the rate of the national average, according to the Centers for Disease Control and Prevention. Some studies place the rate in the Northern Plains, among isolated tribes like the Oglalas, at up to five times higher. Those who want prohibition repealed on Pine Ridge say that Nebraska is raking in more than $350,000 a year in tax revenues from alcohol sales that the tribe could earmark for alcohol prevention and treatment. (The reservation has only one treatment center, with seven beds.) They also argue that a repeal would free up the tribal police force, jails and courts. The tribe’s 38 police officers patrol a vast prairie the size of Connecticut, and officers are duty-bound to arrest anyone possessing a can of beer in their own home or who is even suspected of drinking, in public or private. Federal budget cuts approved in March—the sequestration—slashed more than a million dollars from the police budget, further straining the strapped force. At times, only nine officers police the entire reservation. Opponents say the revenues alcohol would bring amount to little and repeal will make matters worse. They argue that the eight other tribes in South Dakota all allow alcohol and all suffer similar ills, including border town drinking. Many Oglalas are also against legalizing alcohol, introduced to the Indians by the Europeans, on principle. They call it a form of genocide, counter-productive to “walking the red road” to peace and prosperity. Traditionalists are furious that the question has even come to a vote. Most of Nebraska’s lawmakers, including the governor, receive campaign contributions from Anheuser-Busch, whose Hurricane High-Gravity Lager is the drink of choice in White Clay. Last year, the tribe sued Anheuser-Busch and other distributors in White Clay, as well as the package stores, accusing them of encouraging the illegal sales, transport and consumption of alcohol on the reservation. A federal judge dismissed the suit for lack of jurisdiction. For years, Nebraska lawmakers have said that while the situation in White Clay is tragic and appalling, the package stores are operating within the law. Not so, say a group of activists who’ve set up Camp Zero Tolerance just outside White Clay. Nebraska flouts laws against open drinking, public drunkenness and selling alcohol to inebriates, not to mention ignoring crime in White Clay, they say. For months, the activists have organized increasingly confrontational blockades of beer trucks, claiming a small victory when one beer distributor decided last month to stop deliveries to White Clay. But those who favor repealing the ban in Pine Ridge say that for too long, tribal members have blamed White Clay for their own bad choices. “No one is pouring this can of beer down my throat,” said Albert Brave, a 52-year-old White Clay regular who could not remember a time in his life when he did not drink. “Childhood, maybe,” he said, taking a slug from a 16-ounce can of Hurricane. The pageant of misery in White Clay is the shame of the Oglalas, including those who drink. The inebriates are often victimized by gangs who beat them for sport. Unsolved murders have haunted the place for years. Last month, a regular who’d gone to White Clay creek to sleep off her drink was gang-raped and beaten to within an inch of her life. “I’m scared to fall asleep here,” said a 52-year-old woman who asked that she not be quoted by name for her daughter’s sake. If the alcohol ban is repealed, she said, maybe she would just stay in her home, on a town on the rez about an hour away. “But we’re like family here,” she added, so maybe, she’d still want to come to White Clay.